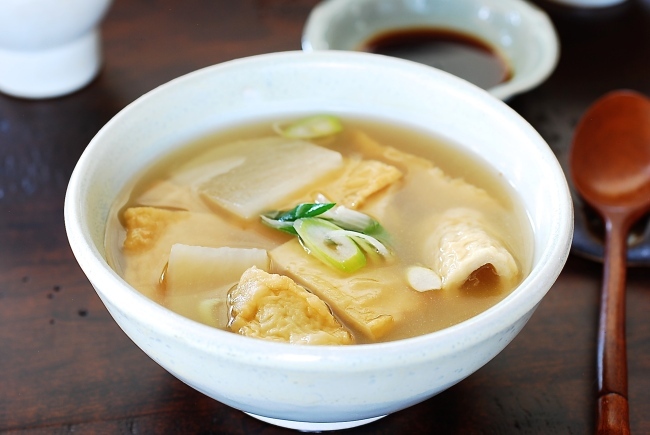 When it’s cold outside, eomuk simmered in a light savory broth is a comfort food at its best! Eomuk is processed fish cake made with pureed fish and other ingredients. It’s a common ingredient used in various Korean dishes such as gimbap and eomuk bokkeum (stir-fried). The street version of eomuk guk is conveniently served on long skewers with the hot broth served separately in a cup. At home, eomuk guk can be prepared without skewers as an easy everyday soup! Eomuk comes in many shapes and sizes. You can use any type or a combination of different types for this recipe. Simply cut them into bite sizes if necessary. A simple anchovy broth is all you need for this soup. You can of course use more complex broth if you like. A dried or fresh hot chili pepper will make the broth taste really good, giving a subtle spicy kick to the broth while reducing the oily taste of the fish cakes. Cut the fish cakes into bite size pieces if using large pieces. Quickly blanch the fish cakes in boiling water, and then drain to remove excess oil. Cut the radish into about 3-centimeter thin squares. Add the radish slices to the broth, and boil over medium high heat until the radish turns translucent and soft, about 5 minutes. Stir in the garlic and soy sauce. Add the fish cake, and boil for a few more minutes. Season with salt and pepper. Drop the scallion in before turning off the heat.